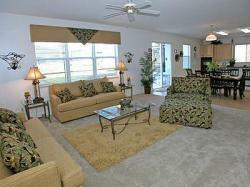 Sweet Retreat is a new, executive holiday home located at the sought after Legacy Park just one minute from HWY 192. 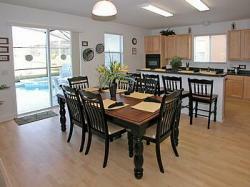 This elegant home is perfect for family groups, comfortably sleeping up to 12 guests. Your stay in such spacious luxury will leave you with memories to treasure for a lifetime! Having Disney (7 miles), major theme parks & attractions, championship golf courses, shops, supermarkets & restaurants nearby you can certainly fill your days! If it's relaxing by the pool you love, Sweet Retreat offers that too...with a large, private, heated pool, bubbling spa, plenty of poolside furniture & a convenient pool bathroom. 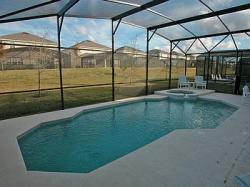 A pool safety fence is provided & alarmed doors to the pool area give peace of mind when children are about. The luxurious downstairs accommodation comprises of a formal living & dining area, family room, dining area with breakfast bar, well equipped kitchen & master bedroom with en-suite bathroom. The upstairs accommodation is equally elegant with a palatial master en-suite bedroom, a king-size en-suite bedroom, a family bathroom, 3 twin bedrooms & a fully equipped laundry room. WE OFFER DISCOUNTS FOR 2 WEEK BOOKINGS & HAVE LATE DEALS AVAILABLE NOW.